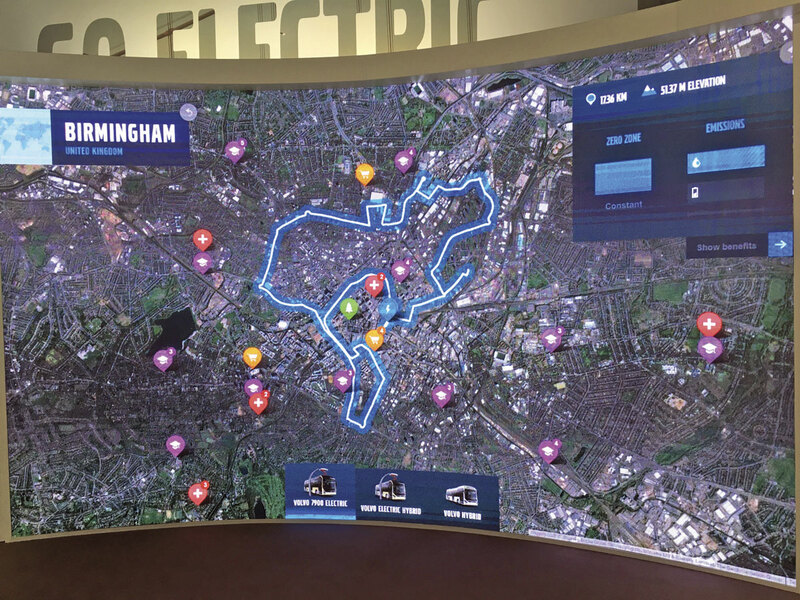 Before every Euro Bus Expo show, Volvo Bus holds a press event to review the previous year, look ahead to the future as well as outlining what will be exhibited at the Birmingham show. This year’s, held near Ascot, presented a very positive message. For Volvo Bus in the UK and Ireland, Nick said that 2015 was the best year the bus operation had ever had in the UK in terms of performance and they would be building on that again this year. The number of buses and coaches delivered in 2016 would be 170 more than in 2015. He predicted a total of 1,005 compared with 830 last year, around 15% of that accounted for by the Irish market. Parts sales were also good. At previous events the ambition to grow Volvo’s share of the parts market had been mentioned and the success of this emphasis was evident when Nick noted that in 20 different weeks the company had invoiced over £1m in parts in the UK, a figure that was continuing to grow. In terms of workshop hours, bus represented 12% of those sold across the whole network, reflecting the increased emphasis on selling vehicle contracts and also the greater complexity of modern vehicle systems. To date, there had been no impact from Brexit, it was ‘not Armageddon’, though infrastructure projects had slowed down. It was business as usual with a strong 2017 order book and no order delays seen. So far there had been no impact other than money market volatility and this hadn’t impacted on prices yet, though with a 16% drop in the value of the pound since Brexit this would hit at some stage. Volvo sold a lot of coaches from stock and it could be that the next stock would be more expensive. Nick thought there was evidence of customers getting in early. I have written extensively in the past about Volvo’s investment in its electromobility range: hybrids, electric hybrids and full electrics. One thing customers may not be aware of is that fear of what battery life will be and any potential costs associated with battery changes, can be avoided through battery contracts. Under these, operators rent the batteries at a monthly figure for an appropriate period (usually matched to contract requirements) which might be five, seven or 12 years. On all Euro6 powered Volvos (but not Euro5s), batteries can be remotely monitored. Of 2,949 electric and hybrid buses sold globally, the UK accounts for a whopping 1,416, not much less than half, with London taking the lion’s share of these. To put this in context, the next greatest concentration of Volvo electric and hybrid buses is in Columbia which has 468, while the biggest European parc is in Spain where there are 137, less than 10% of the UK total. 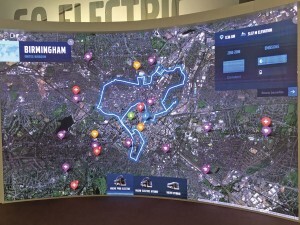 For 2017, Volvo will continue to concentrate on its key focus areas which, in addition to aspiring to provide leading customer satisfaction, will be to boost dealer support to complement customer needs and drive customer satisfaction as well as aligning the City Mobility strategy with customer and dealer requirements. It will also seek to attract and retain the best staff and stress personal development. The final strand of the future plan will be to implement City Mobility by preparing the necessary people and support and putting the necessary planning and project management capabilities in place. The Volvo sales responsibility is split on a retail/commercial basis though both teams operate on a cross functional basis. Retail Sales Director, James Hyde, explained recent developments within the staff line up which have seen Sales Engineering Manager, Norman Thomas, join the Retail team with Dave Porter moving from Customer Services Manager to take on the sales responsibility for the Republic of Ireland. A new Customer Services Manager will be appointed along with a second vehicle Coordinator. An addition to the sales team is the Regional Sales Manager for the South West, Sam Plethero. 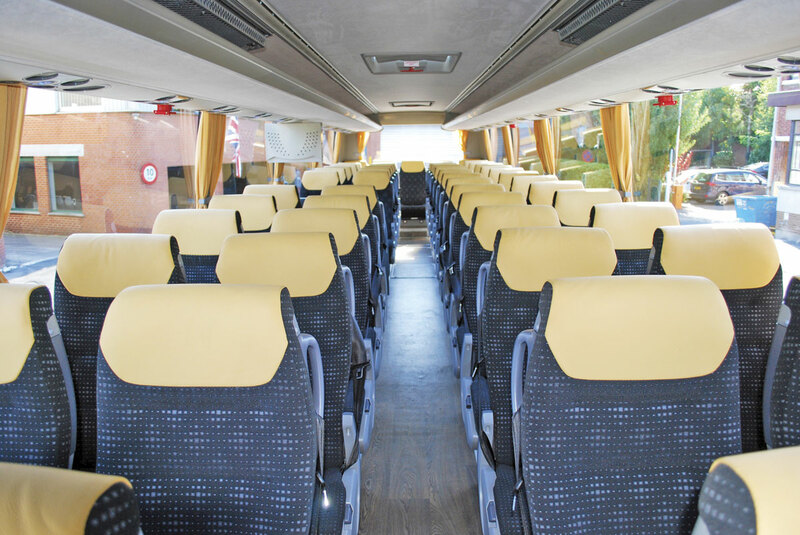 All members of the sales force offer buses as well as coaches. James Hyde explained that, of the Volvo coaches sold in the UK and Ireland, 38% are sold through the retail operation at Coventry, 41% are sold by Plaxton with their coachwork and 21% are sold through Caetano to National Express, predominantly on B11R chassis. 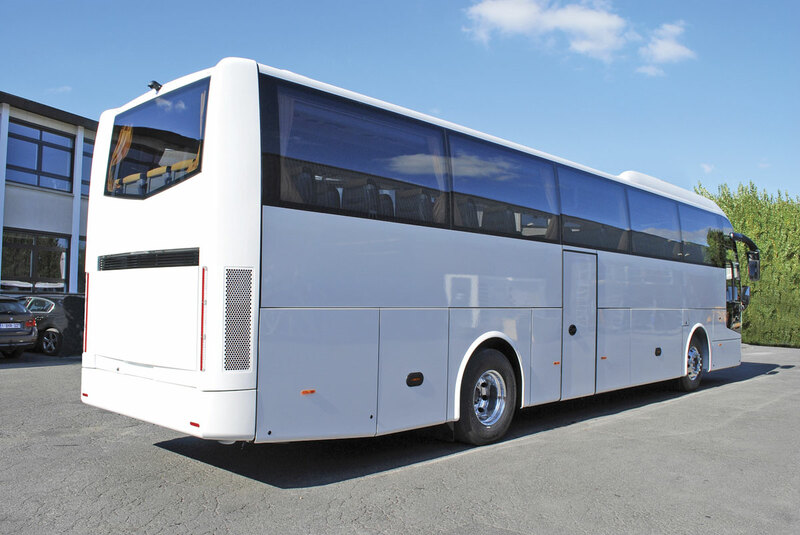 In 2016, Volvo will invoice a total of 372 new coaches which it claims will give it 38% of the market. Coventry has grown in importance to Volvo since 2007 when it sold 78 new coaches on a retail basis. That figure has now increased to 130 in 2016. Currently, it offers the Sunsundegui SC7 range on the B11R as well as the recently launched SB3 and short SC5 on the B8R, the Jonkheere JHV on the B11R and the Volvo’s own Polish built 9700 range on the B11R. He noted that Plaxton offered a wider choice on the B8R, including both the Leopard and the Panther 3. 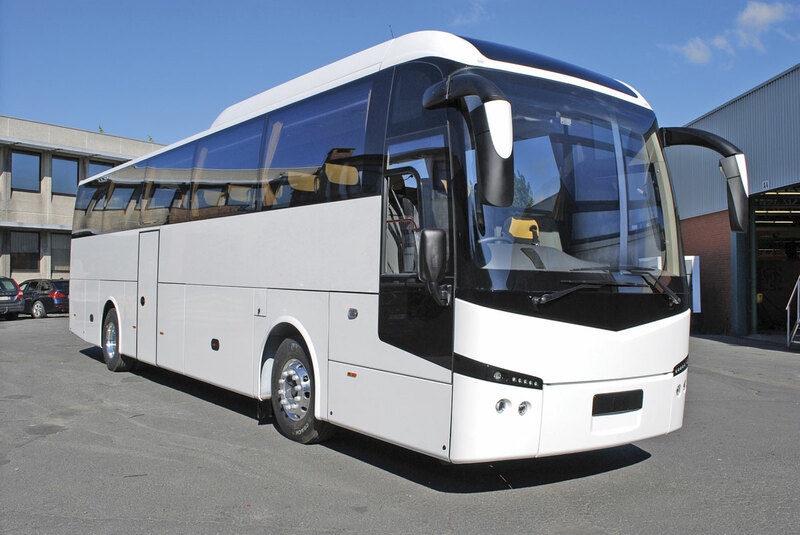 In total, Volvo offers 13 different coach chassis/body combinations, most of them in various different length variants, some including tri-axles. Speaking of Sunsundegui he said that the Spanish company was now profitable and financially stable, and would be investing in its premises this year including improvements to the paint shop. Around 45 would be sold in 2016, including 15 SB3s. Volvo’s own Wroclaw built 9700 was a premium product and of the 330 sold so far, around 60% had gone to Ireland. James anticipated that 35 would be sold in 2016. For Coventry, the mainstay is the Volvo B11R Jonkheere JHV combination which is offered in lengths of 12.6m, 13.4m and 14.0m, sales of which will be over 70 units this year. With only one example of the existing Jonckheere JHV bodied B11R left unsold, the NEC will see the unveiling of the new JHV2 which is definitely a styling evolution rather than a revolution, indeed it is one of the subtlest revamps I can remember on a coach design. This approach is typical of Jonckheere parent company, VDL, as the Futura (also designed by Axel Enthoven) retained essentially the same look in a production run of around 30 years. Volvo has worked directly with Jonckheere for the last two decades in the UK selling over 1,100 units in that time. The JHV was originally launched in 2007 and the key points of the new version are: a completely new dash; LED exterior lighting as standard; restyling of the front and rear; improved sound insulation; improved Thermo King heating and cooling; a reversing camera as standard; the lighter Fainsa Brava seat (with plastic back) in place of the Gala unit; a 250kg weight saving; a new peage window; and additional locker space at the offside rear. Already two JHV2 orders have been placed. 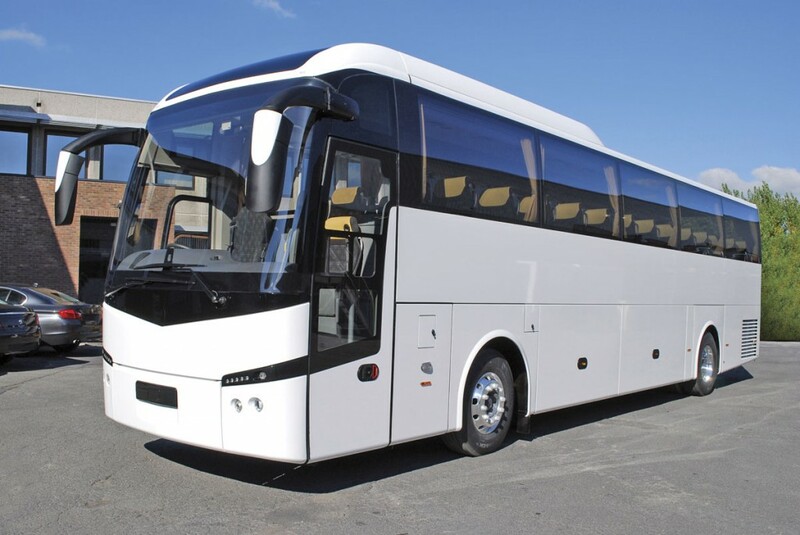 Travellers Choice of Carnforth has ordered eight B11Rs, split equally between two-axle 53 seaters and three-axle 65 seaters and Park’s of Hamilton is taking ten B11Rs. Looking at the chassis range, James pointed out how much development work had been done and how many new features introduced in the past 18 months. Apart from the Comfort Suspension system and DSS braking, there was Volvo Dynamic Steering system, Generation F of the I-Shift gearbox and the new active suspension system, all of which are standard. In addition for those who want it as a cost option for express service work, there is the I-See system which works with the I-Shift transmission when in cruise control mode to map and learn a route in order to better match its performance. This system was found to save 4% on fuel when used in trucks, we were told. In his presentation, Commercial Sales Director, Phil Owen, ran through his team, also stressing their cross functional responsibilities and said there would be a new Project Manager appointed in order to help implement the City Mobility programme. 2016 will see 644 buses delivered of which 232 are B5TLs, 29 are B8RLEs and 383 are B5LH hybrid double deckers, mostly for London. This represents a market share of 34%. It was the company’s target that 25% of new buses would be sold with contract maintenance packages of some kind, and this was currently running at 19%. There are three levels of package, and of these it was the Gold level package including labour, parts and servicing that was proving the most popular. Referring again to the battery contracts offered, he said most who took them were going for the 12 year option and that contracts covering 50 buses had been sold. Under the agreement, batteries needing replacing will always be replaced with units of the latest standard. Volvo had been involved in five OLEV bids and had hoped to win three, though in the event it won two, but was delighted with them. In vehicle terms, the biggest is that for Arriva Liverpool which will see 51 Wright Gemini 3 B5LH hybrids supplied from December this year. These are Arriva’s first Euro6 Volvo orders. The second OLEV success is the Harrogate City Mobility scheme that will see Transdev Blazefield Harrogate & District operate eight vehicles on three routes in Harrogate, the 2A, 3 and 6-X6. The buses will be 12m 7900E single door electric models using opportunity charging stations located in the bus station. The supplier of the recharging infrastructure has yet to be determined but the open interface scheme will be operational in the first quarter of 2018. The 7900Es will be on gold repair and maintenance packages. Phil also announced a new electric hybrid bus model which is a development of the existing B5LH and 7900EC and will be launched at Euro Bus Expo. The Volvo B5LHC Electric Hybrid has a more powerful electric motor, increased capacity Lithium Ion batteries rated at 19kWh and fixed roof mounted charging rail equipment for opportunity charging. It will be able to operate emission free for a distance of approximately seven kilometres and will recharge in between three and six minutes. 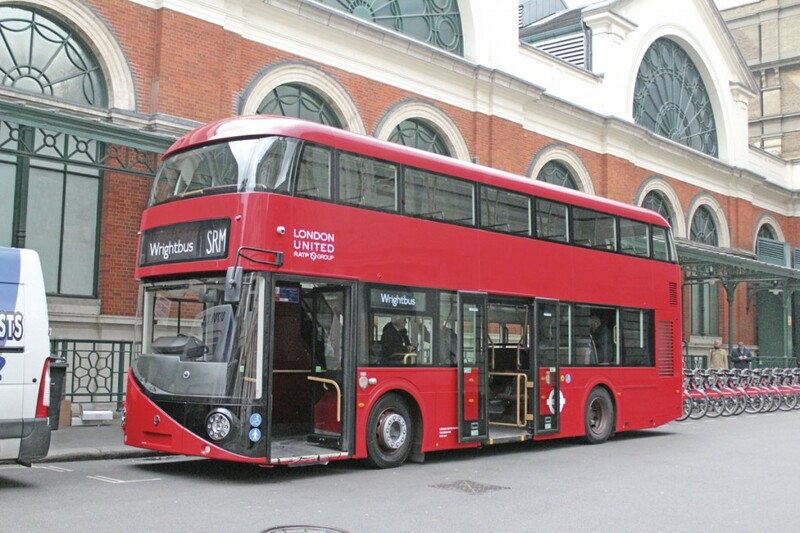 Scheduled to go into demonstration service with TfL next year, and built to TfL specification, it has 10.6m two-door Wrightbus SRM style bodywork seating 60, 43 of them on the upper deck. Total passenger capacity is 87. It is 10.6m long and 4.42m high with a 4.82m wheelbase. 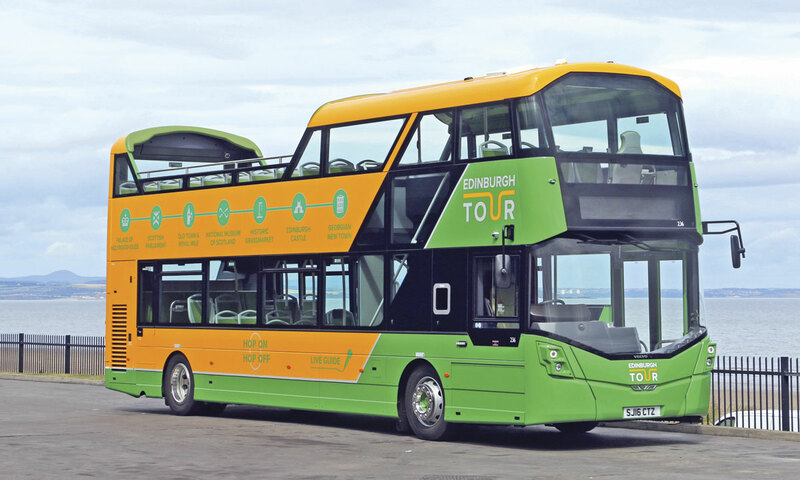 The new Double Deck will be displayed at the show underneath a pantograph, demonstrating the opportunity charging system which Volvo sees as proven technology. 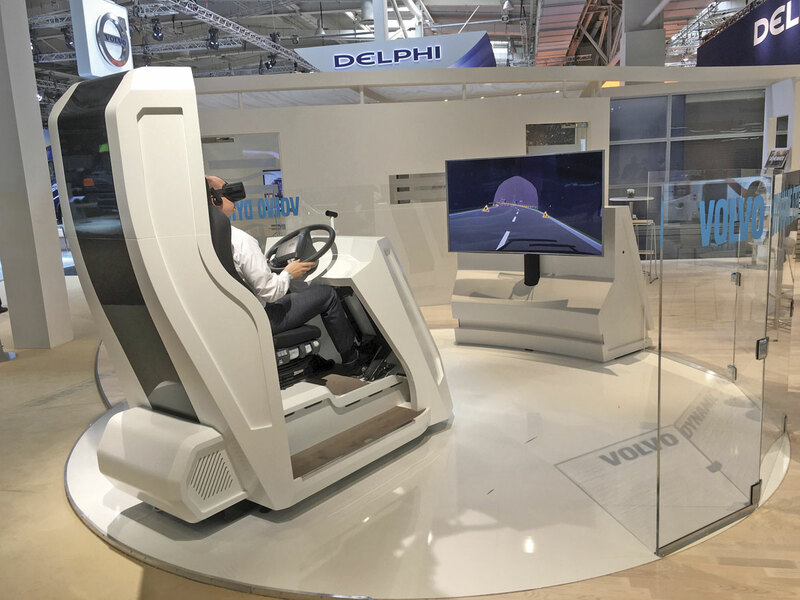 Further new products to come from Volvo include the VDS steering system for buses in the first quarter of 2018 and, next year, a new pedestrian and cyclist detection system with both interior and exterior audible warnings. The latter is already on test on route 55 in Gothenburg. There will also be a 10.8m long version of the 7900E single deck. 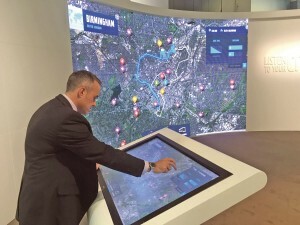 Appearing on the stand in Birmingham will be three vehicles. These will be the new B5LHC electric hybrid with Wrightbus SRM body, a B11R Jonckheere JHV2 tri-axle for Travellers International and an open top 11.5m B5TL Euro 6 Wright Gemini 3 for Lothian Buses from the batch of 30 recently delivered. Two further vehicles will appear outside. These will be a 9700 B11R tri-axle coach and a Sunsundegui SB3 bodied Volvo B8R. Also on the stand will be a number of non-vehicle exhibits including a simulator giving visitors the opportunity to sample the VDS (Volvo Dynamic Steering) system, a City Mobility simulator showing the relative benefits of Volvo’s electromobility range in cities across the globe and a model illustrating the charging rails to be used on electric buses.